The majestic Burghley rocking horses bring together selected British timber, superb craftsmanship and the finest accessories to create a rocking horse without compromise. 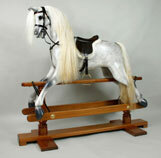 The lively, but smooth and stable riding action surpasses that of any rocking horse we know. It is best appreciated in extra large and king size - ideal for older children and adults. You will simply love riding one of these horses, whatever your age!! 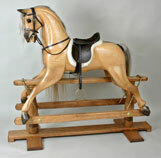 Burghley rocking horses were created with horse lovers in mind. This is very apparent in the English sweet chestnut rocking horse, whose light, airy appearance and gorgeous and detailed grain emphasise the lifelike qualities of the rocking horse. 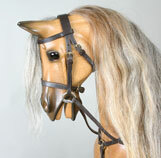 The detailed and friendly facial features of the sweet chestnut rocking horse head are complimented by a long and luxuriant mane of specially selected horsehair. A Burghley rocking horse has a friendly face, a warm personality and a long, abundant mane and tail which just love to be stroked! 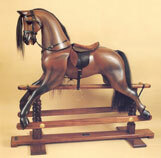 The Burghley dapple grey rocking horse is carved from superb English walnut and finished in a gorgeous satin finish. Our craftsman applies a satin mahogany stain and polish to English walnut with great subtlety, which gives the Burghley mahogany rocking horse a most attractive hue with lovely tonal variation to the finish. The removable tack is hand-stitched from finest Sedgwick leather by a Master Saddler and includes a splendid rocking horse saddle and a numnah made from Pure New Wool. 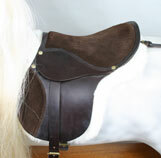 Padded knee rolls and a hunting breastplate are available as options.